Can all of the talk about Mangini coming from a run style, Belichick/Parcells system and Holmgren coming from a west coast system finally stop. The last time I checked, the Patriots throw it all over the field and the they seem to rely on the short pass routes to move the ball. Belichick understands you use the talent you have and Mangini surely believes in the same principles. The problem is that the Browns don’t have the talent. However, I think all of that will change with Holmgren at the helm. I just hope that Mangini is there to coach that talent. I remember being one of the few who never gave up on Belichick when he was in Cleveland. Even during the Kosar feud. My friends will attest to that fact. We sat watching plenty of football arguing over that issue most Sundays during the Belichick era. I believed the guy had a true backbone and stood by what he believed. Even if it meant public ridicule and getting ripped in the papers. Belichick didn’t waver and either does Mangini. 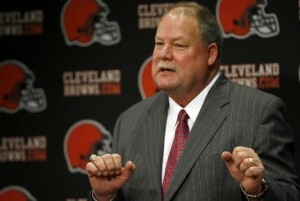 Unfortunately this could be Mangini’s downfall with Holmgren. I hope not.